See what St-Michaels said about two Judo open days for their year 7 and year 8 students. ‘Tekio Gemu have now held two open days for St-Michaels and in both instances delivered 6 consecutive Judo lessons to classes of circa 30 meaning 180 student on each day. Both Adam and Neal were very well organised and set up in advance for the groups to ensure every student maximised their time on the mats. We had very positive feedback from the KS 3 students who took part and definitely made it a valuable part of our PSHE day activities. The sessions were an excellent opportunity for our students to experience high quality sessions and understand the discipline and respect that are integral to any Martial Art delivery. Glen Gibbons – Head of PE, St-Michaels school. 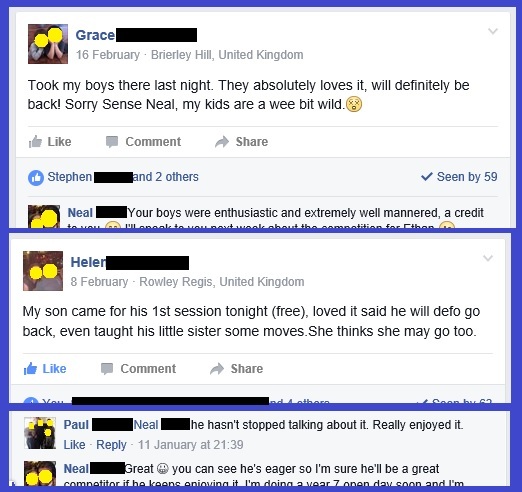 See what the parents of attendee’s to our Judo club said on Facebook.